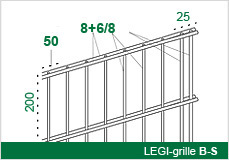 LEGI grilles B Proven. Robust. Reliable. LEGI ball catching fence B/B.i with TÜV approval certificate for noise dampening, corresponding to the ordinance on the implementation of the Federal Emission Control Act. The LEGI ball catching fence was specially designed as a ball catching grille, because the stress is significantly larger than with conventional fences. Ball catching grilles must be built to be extremely robust, but should have a certain amount of elasticity. Posts and grilles joined at their connection: we have ideally coordinated this so that a high degree of security and efficiency are guaranteed largely free of maintenance. Double-drawn, round steel wires, horizontal 8 mm, vertical 6 mm and 8 mm Ø, offer the smallest contact surface to the aggressive air and rain quickly runs off. Therefore, they are quick drying and covered with small amounts of deposits. There is no risk of injury thanks to the roundness. Posts from IPE profiles according to static calculation. Installation by setting the posts in concrete at a height appropriate for flooding. Foundation sizes according to static requirements. Post spacing 2,520 mm with tolerances of +/- 10 mm. Easy bolting of the mounting bracket using commercially available tools. With at least 7 opposed, horizontal, reinforced twin wires 8 mm Ø per 2,030 mm high grille. Reinforcement of the vertical grille ends facing the posts, each with 2 upright pieces of 8 mm Ø screw wire welded at a spacing of 25 mm. The remaining wire is 6 mm Ø. Around the grille up to 2,000 mm height, 50 x 200 mm and above 100 x 200 mm. As a table tennis ball catch 34 x 200 mm, upright mesh. Effective length 2,520 mm = post spacing. The grille heights of 630 – 2,030 mm in stages of 200 mm. The grilles are bolted one upon the other. As a particularly high fence for securing commercial, industrial and private facilities. Also as a self-supporting trellis fence for greening. Gates and entrances are offered in all standard sizes and shapes.